Be the first to share your favorite memory, photo or story of Elaine. This memorial page is dedicated for family, friends and future generations to celebrate the life of their loved one. 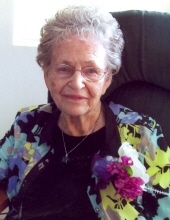 Elaine Lantow age 94 of Nashua, IA, passed away Saturday, December 1, 2018, at Shell Rock Healthcare Center. A funeral service will be held 11:00 a.m. Thursday, December 6, 2018 at Hugeback-Johnson Funeral Home -- Olson Chapel in Nashua with Msgr. John Hemann presiding. Interment will follow the service at Greenwood Cemetery in Nashua with Rachael Lind, Steve Lantow, Lisa Welter, Linda Lantow, Allen Lantow, Annette Lantow, Adam Marth, Jason Marth, Dean Lantow and Megan Miller serving as pallbearers. Friends may greet the family from 9:30 a.m. - 11:00 a.m. on Thursday, December 6, 2018 at the funeral home. Elaine Alice Lantow was born April 15, 1924, the daughter of Carl and Margaret (Carpenter) Ferch. She attended school in Nashua and graduated from Nashua High School in 1941. She was united in marriage to Robert J. Lantow at the Lutheran Parsonage in Nashua on May 7, 1944. To this union five children were born. They lived on several farms east of Nashua before buying their farm in Bradford Township. Besides working with her husband on the farm, she also worked for the Nashua Public School system, Pamida (Gibson) in Charles City and Sara Lee in New Hampton. After moving to Nashua in 1985 she enjoyed working for the city at the Nashua Public Library until she retired. She was a longtime member of St. John’s Lutheran Church. Elaine enjoyed fishing, gardening, crocheting, puzzles, reading, watching NASCAR races and Chicago Cubs games. She will always be remembered for loving her children and grandchildren dearly. Elaine is survived by four sons, Jim (Sandy) Lantow of Ionia, IA, Charles (Lois) Lantow of Nashua, IA, Wayne (Sandy) Lantow of Nashua, IA, Lynn (Deanne) Lantow of Nashua, IA; one daughter Wanda (Ken) Marth of Ottumwa, IA; ten grandchildren; 14 great-grandchildren; one sister Marie Schmidt of California. She was preceded in death by her husband Robert on August 18, 2001; her parents; three grandchildren, Suzanne Lantow, William Lantow, Daniel Lantow; three sisters, Ortha Liddle, Mardelle Greenlee, Marjorie Kelly; one brother Russell Ferch. To send flowers or a remembrance gift to the family of Elaine Lantow, please visit our Tribute Store. "Email Address" would like to share the life celebration of Elaine Lantow. Click on the "link" to go to share a favorite memory or leave a condolence message for the family.